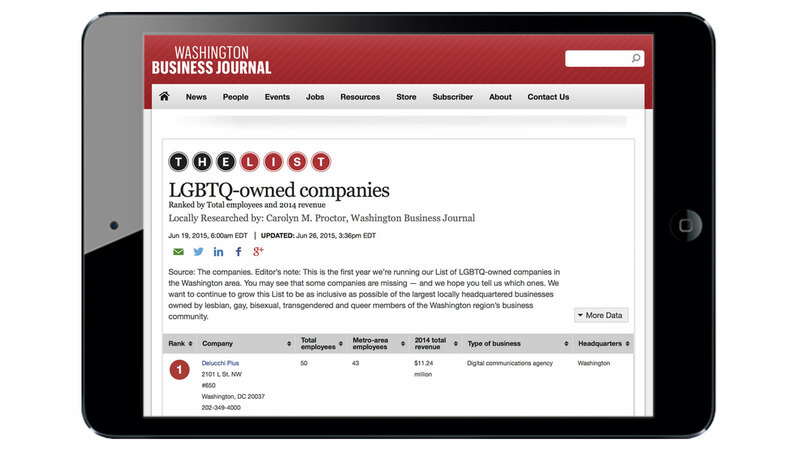 As we gear up to attend next week’s NGLCC International Business and Leadership Conference in Fort Lauderdale, Fla., we’re pleased to announce that Delucchi Plus earned the top spot on the Washington Business Journal’s list of the largest locally headquartered businesses owned by LGBTQ members of the Washington region’s business community. With 43 of 50 2014 employees living in the D.C. metro area and total 2014 revenue of $11.24 million, our D.C.-based digital communications agency tops the list of local businesses. As a certified LGBT Business Enterprise (LGBTBE®), Delucchi Plus is also a qualified partner for brands with diversity budgets to support LGBT companies.